This tutorial explains how to analyse H.E.S.S. data with Gammapy. 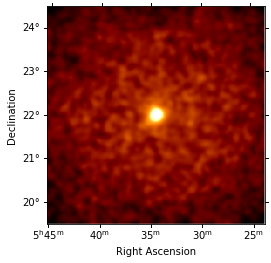 We will analyse four observation runs of the Crab nebula, which are part of the H.E.S.S. first public test data release. In this tutorial we will make an image and a spectrum. The light_curve.ipynb notbook contains an example how to make a light curve. To do a 3D analysis, one needs to do a 3D background estimate. In background_model.ipynb we have started to make a background model, and in this notebook we have a first look at a 3D analysis. But the results aren’t OK yet, the background model needs to be improved. In this analysis, we also don’t use the energy dispersion IRF yet, and we only analyse the data in the 1 TeV to 10 TeV range. The H.E.S.S. data was only released very recently, and 3D analysis in Gammapy is new. This tutorial will be improved soon. This tutorial also shows how to do a classical image analysis using the ring bakground. To access the data, we use the DataStore, and we use the obs_table to select the Crab runs. Let’s make some 3D cubes, as well as 2D images. For the energy, we make 5 bins from 1 TeV to 10 TeV. np.logspace(0, 1.0, 5), unit="TeV", name="energy", interp="log"
Compute the mean PSF for these observations at the Crab position. lon_0="83.6 deg", lat_0="22.0 deg", frame="icrs"
index=2.6, amplitude="5e-11 cm-2 s-1 TeV-1", reference="1 TeV"
We compute a residual image as residual = counts - model. Note that this is counts per pixel and our pixel size is 0.02 deg. Smoothing is counts-preserving. The residual image shows that currently both the source and the background modeling isn’t very good. The background model is underestimated (so residual is positive), and the source model is overestimated. 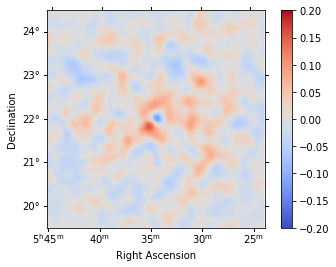 We could try to improve the background modeling and spatial model of the source. 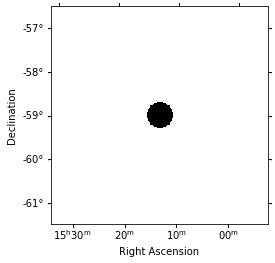 But let’s instead turn to one of the classic IACT analysis techniques: use a circular on region and reflected regions for background estimation, and derive a spectrum for the source without having to assume a spatial model, or without needing a 3D background model. data_sel = data_store.obs_table["TARGET_NAME"] == "MSH 15-52"
We first have to define the geometry on which we make our 2D map. np.logspace(0, 5.0, 5), unit="TeV", name="energy", interp="log"
We choose an exclusion mask on the position of MSH 1552. We will use compute_lima_on_off_image in gammapy.detect to compute significance and excess maps. 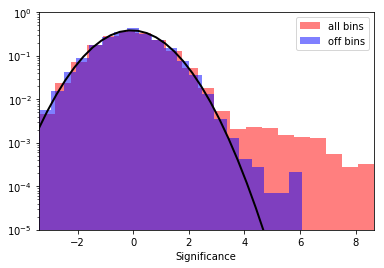 A common debug plot during Ring Analysis is to make histograms of the off count rates, so we will plot that as well. Again: please note that this tutorial notebook was put together quickly, the results obtained here are very preliminary. We will work on Gammapy and the analysis of data from the H.E.S.S. test release and update this tutorial soon. Try another model, e.g. a Gaussian spatial shape or exponential cutoff power-law spectrum.